There are many different ways to market your vacation rental properties, but channel marketing is still the most effective strategy for attracting new guests and generating new bookings in the vacation rental industry. Advertising your property (ies) on the right vacation rental sites, while using the right marketing techniques (more on this below), will give you access to more than enough traffic and visibility to build a consistent and sustainable source of new bookings for your vacation rental business. Below is a list of the absolute best vacation rental websites to advertise your properties - in no particular order of preference. As our industry continues to see a lot of consolidation through mergers and acquisitions, many of the websites listed below are now part of larger website families grouped together under larger brands. Ultimately, the sites on this list are the most established and most popular vacation rental sites in the industry. We compiled this list from our experience managing 1000s of bookings worth tens of millions in rental income & revenue. And we’re very confident in saying that each and every one of the sites on this list would be a great addition to your marketing distribution portfolio. Now, without further ado… Let’s begin. The vacation rental division of TripAdvisor has a strong portfolio of very popular websites. Put together, the TripAdvisor family of websites owns a very significant portion of the vacation rental search traffic, with complete exposure to over 340 million travelers per month - but most importantly - it's free to list your properties! That said, it’s also important to keep in mind that the 340M visitors also includes all of the people searching reviews of restaurants, attractions, activities, etc... before and during their vacation. So realistically, the number of travellers actively searching for vacation rentals will be less. Nonetheless, if a traveller is looking to book a vacation rental on his or her next trip, there's a pretty good chance that TripAdvisor - along with one of the 12 other websites they own - are going to be some of the first places they'll look. In total, TripAdvisor family offers distribution to 5 separate channels (plus international affiliates), and they’ve implemented different distribution packages, depending on which site you choose to sign up with. So depending on where your properties are located, and which geographical markets you prefer to target, you won’t have to worry about creating multiple different accounts on each website. FlipKey is most popular in North America, with an estimated 1.9M visitors per month, with over 65% coming from the US & Canada alone. On its own, FlipKey gets enough targeted visibility to provide an average of 72 inquiries per listing per year. HolidayLettings is most popular in Europe and the United Kingdom, with an estimated 2.2 million monthly visitors. HouseTrip sees roughly 500,000 visitors per month and has a very strong and diverse european audience. Niumba has roughly 1.4 million visits per month, and growing, over 90% of their traffic coming from Spain. And of course, we have the TripAdvisor portal itself, along with its many worldly extensions (.ca, .it, .co.uk, etc…) which makes up the bulk of its worldwide traffic. a manager account, or an individual account. Both have the same, seamless distribution to all of TripAdvisor channels, with the same free-to-list option for just 3% per booking with no upfront charges. If you have more than 5 properties, you can sign up for a manager account, which will give you access to a better quality of customer service, connectability with certain property management softwares, and two other payment options. 2 - a subscription model (fixed yearly fee per listing + 3% per transaction), which can vary in price depending on the size of your inventory, and that will remove any booking fees that are typically charged to the traveller -- which in return can remove some friction and make closing bookings easier. Getting a manager account up and running can be a very lengthy process. TripAdvisor requires extra paperwork to be completed for manager accounts and this can take a while to be processed and get approved. Even with the massive amount of visibility they bring to your properties, the true value of advertising your properties with TripAdvisor is the name. TripAdvisor is known all over the world as one of the most trusted brands in travel (even despite the many contradictions in their review policies and sometimes difficult customer service). So a strong review profile with them can add some serious credibility to your business. Most importantly, it’s free to list your properties with them. And that goes for both manager accounts AND individual accounts. There’s no up front charges, just a low 3% booking fee per confirmed booking. Advertising your properties on the TripAdvisor family is a must for anyone who takes their vacation rental business seriously, and at the very least you can give them a try and test it out completely risk-free. Click here to learn even more about listing your property(ies) on the TripAdvisor Family of vacation rental websites and create your new account today - 100% FREE! Founded in 2008 and based in San Francisco, AirBnB is undisputedly the fastest growing vacation rental website in the world today. Their massive popularity has been both a blessing, as well as a curse. They are constantly in the spotlight and are consistently mentioned in almost every tech news cycle (even hitting INC. Magazine's cover as the 2014 Company of The Year - source). But with great popularity also comes great responsibility, as they are consistently at the forefront of government regulation battles and are constantly paving the way for the rest of the industry. And as it stands, they're only getting started. With an estimated 88 to 120 MILLION travellers visiting the website every month, AirBnb is both the fastest growing AND most popular individual vacation rental website in the world today (they don’t have multiple websites under an umbrella, just the one). Not to mention, when we perform market analyses for our clients, we've noticed that the number of branded searches for Airbnb are often 10X-15X more than any other channel (for example: "airbnb Costa Rica" vs "VRBO Costa Rica"). Which means that their brand recognition and loyalty is much higher than any other channel in the vacation rental industry right now. AirBnB.com has roughly 50-65 million visits per month alone, with over 50% of their traffic coming from the US alone. PLUS: They also have many different international domain extensions (such as: .co.uk, .ca, .es, .it, .de, .fr, .it), which account for another 38 to 55 million monthly visits. What’s more, it's 100% free to list your property and advertise with them, and your properties will be distributed to ALL of their international domains - that's access to 88 to 120 million travellers per month! Airbnb’s listing services works on a commission pay-per-booking model, charging a simple transaction fee of just 3% per booking, making virtually risk-free to try out. AirBnb also offers a pretty good protection plan with their Host Guarantee. They offer coverage of up to $1,000,000 in the rare event your property is damaged by a guest, which also happens to be one of the highest policies in the industry right now. Another great thing about Airbnb is how their transparent community and review system, which allows you to know more about the person renting your properties. Not only are owners/hosts reviewed for their properties, but travellers are also reviewed by their hosts. Which means you get to see if the person requesting to book at your property has been respectful with others or not. Ultimately, it's absolutely free to create your account and explore it to see for yourself. What's there to lose? Click here to learn even more about listing your property(ies) on Airbnb and create your new account today - 100% FREE! A true giant, Homeaway is the 800 pound gorilla that has been dominating the vacation rental industry for years. No matter where travelers are looking to book their next vacation rental, chances are that one of the 25 websites in HomeAway’s network will be one of the first sites at the top of their Google search. The HomeAway family owns many very successful sites, including VRBO , VacationRentals.com , and Homelidays (french), with their entire portfolio of channels reaching as much as 70M travelers per month. And while they used to offer separate subscription packages for each channel (or website), they have since consolidated everything into one massive distribution package and are now offering seamless distribution to their 25 high trafficked websites, making sure your properties reach every corner of the world. HomeAway.com has roughly 14.3 million visits per month, with over 60% of their traffic coming from the USA alone. They also have many different international domain extensions (such as: .co.uk, .ca, .es, .it, .pt, .nl), which account for another 3.15 to 6 million monthly visits. VRBO has roughly 18 million visits per month, with over 90% of their traffic coming from Canada and the US alone. HomeAway.co.uk & OwnersDirect.co.uk generate roughly 2.4 and 1.4 million visits per month respectively, with over 55% and 75% of their traffic coming from the United Kingdom. Homelidays has roughly 1.5 to 3 million visits per month, and growing, with over 80% of their traffic coming from french speaking countries such as France, Belgium and Switzerland. VacationRentals.com has roughly 250 to 600 thousand visits per month, with over 80% of their traffic coming from Canada and the US alone. PLUS: let's not forget the 21 other websites and millions of monthly visitors within their distribution network. Best for those who make less than $7,000 per year in bookings and would rather not to be billed with an annual subscription, and would like to try HomeAway for free. The PPB option costs just 8%-10% per confirmed booking (5% commission + 3%-5% for the transaction with HomeAway Payments (depending on which country your bank account is located and which country the credit card was issued). To learn more about the HomeAway Payments credit card transaction fees click here . Quick Note: In order to qualify for the PPB account, you must use HomeAway Payments (by VacationRentPayment), you must have a bank account and billing address in one of the following countries: USA, Canada, Austria, Belgium, France, Germany, Greece, Guernsey, Ireland, Italy, Jersey, Netherlands, Portugal, Spain, Switzerland, and the United Kingdom. Not all countries can qualify for HomeAway Payments, and therefore not all properties will qualify for a Pay-Per-Booking account. HomeAway's $499/yr subscription model is the most valuable option they offer because it allows you to save the extra 5% that PPB listings have to pay for every booking. And keep in mind, 5% can amount to a heck of a lot of $$$ in the long run, especially when you consider the fact that all you need is $8,000 in booking revenue before the PPB model becomes a waste of money. We save our clients tens of thousands of dollars per year by choosing the subscription model . On the other hand, if your properties are in one of the qualifying countries, you can also opt in to using HomeAway Payments (and pay the 3%-5% in transaction fees per booking). HomeAway payments definitely makes things easier, and more streamlined, but it ultimately comes down to what you think is better for YOUR business. Ultimately, your choices are more visibility with more potential profit (the subscription model), or zero risk with a little less potential profit. And no matter how you look at it, HomeAway should definitely be a part of your channel marketing portfolio as it will most likely be one your top 3 sources for new bookings, if not the first. Click here to learn even more about advertising your vacation rental properties with HomeAway and create your new account today - FREE! As their slogan suggest, Booking.com is the world’s #1 accommodation site . And with over 430M monthly visitors, it’s easy to see why. Recently, they’ve been making real strides entering into the vacation rental space, and although the vast majority of their traffic comes from people searching for all the other forms of accommodations (hotels, B&Bs, etc…), they are now building enough market share to join the ranks of the HomeAway Family, the TripAdvisor Family, and Airbnb. What’s more, it's 100% free to list your property with them and your properties will also be listed directly on the big search engine maps (like Google Maps), and distributed to a wide array of their international affiliates -- which will offer potential access to millions more travellers per month! Booking.com ’s listing services work on a commission pay-per-booking model, charging a transaction fee starting at 15% per booking (depending on location and booking volume), making them the most expensive channels on this list, but still virtually risk-free to give a try. For property owners or PMs (property managers), they operate a little differently from the other vacation rental websites on this list. For example; you don’t have to pay commission on bookings for guests who never check in, but all guest bookings are instantly confirmed and deemed commissionable. Which means that potential guests can book instantly without ever communicating with you beforehand. And although Booking.com is currently working on the ability to process payments for owners and managers in certain locations, for the most part, you must be able to accept and collect payments from guest directly. QUICK TIP: We use FRESHBOOKS to send our e-invoices because they’re easiest and most simple to use, and you can connect to your favorite payment gateway to start accepting credit cards with the click of a button. Plus the quality of their customer service is almost unmatchable! You'll also need to have a strong vacation rental agreement and insurance policy to protect yourself independently, as Booking.com offers very limited protection for owners/managers compared to the other sites on this list. It's absolutely free to create your account and explore it to see if advertising on Booking.com fits into your business model. For some of our clients, Booking.com is a significant revenue generator within their distribution portfolio. For the most part, we only use them to help diversify a little bit and advertise during the low and off-peak seasons. Ultimately, you’ll never know if Booking.com is right for you unless you give it a try. And since it’s completely risk-free , what's there to lose? Click here to learn even more about listing your property(ies) on Booking.com and create your new account today - 100% FREE! Did you know is that those 4 website families, put together, account for roughly 70% of all vacation rental traffic? Research shows that 67.6% of ALL clicks in Google go to the first 5 organic search results alone, with another 5.59% going to results 6 to 10. 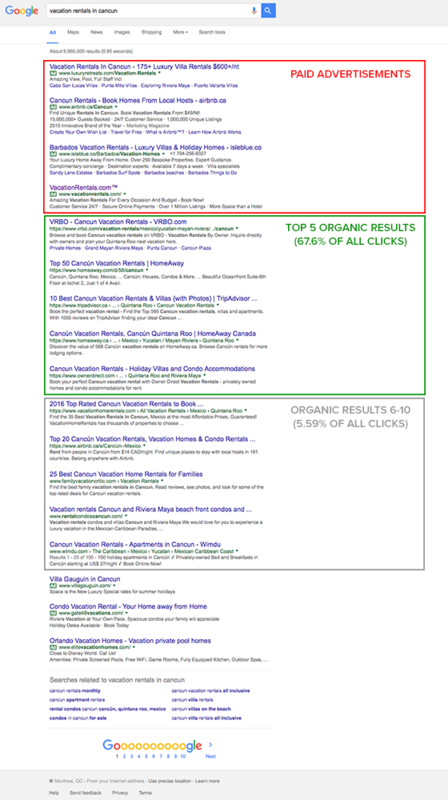 That means the organic results in Google’s first page alone account for over 73% of ALL it’s traffic, while the other 27% is split up between everything else (paid ads, news results, local results, and all of the other search results pages). The HomeAway Family, Airbnb, TripAdvisor Family, and ﻿The Booking.com Group more or less MONOPOLIZE the first 5 organic search results in Google for basically any search term related to “vacation rentals” or even “holiday rentals” (if not the entire first page) - in ANY given destination in the world. You might find an exception here and there, but it’s safe to say that if you do a quick Google search for “vacation rentals in”, or “holiday rentals in”, or some other derivative keyword for your chosen destination, you will see that each website within the first 5 organic results is going part of the top 3 vacation rental website families listed in this article. - covering the first 67.6%. You will also see that they have a significant presence in results 6-10+ AND paid placement, which adds even more to their market share of traffic - and there's your other 5.59%. Looking at the above example: Airbnb, HomeAway and TripAdvisor have 2 results in the top paid ads, ALL 5 of the first organic results, and 2 more in results 6 and 7. So if you add the 67.6% with the 5.59% - with a small margin of error - then you've got over 73.2%. That means 7 out of 10 people searching for vacation rentals on the most popular search engine in the world by far (Google), will most likely land on one of those top 3 vacation rental website families and most likely book through one of them as well. KEEP IN MIND: That doesn’t even include all of the other derivative keywords that these channels rank for, or any the direct traffic that they receive from strong branding and loyal/repeat/referred travellers. So if we now factor in brand recognition; HomeAway, Airbnb, TripAdvisor, and Booking.com Group have the biggest brand recognition in the vacation rental industry, with the with the most amount of direct/returning traffic, and the biggest media presence out of any other channel in the industry by far. Needless to say, these 4 website families above will give you access to more than enough traffic and visibility for your vacation rental business. HOW you market your properties and HOW you manage your bookings on these channels is just as important - if not, more important - than choosing which ones to advertise with. Generating REAL results from channel marketing takes a lot more than just publishing your properties on these 4 channel families. The market leaders (ie: the highest earning properties in every market) typically operate at +75% occupancy rates or higher, with many of them listed on just two channel families. In fact, when we perform local market analyses for our clients, we also find that a significant number of the market leaders are listed on just one channel. And although we definitely don’t recommend putting all of your eggs in just one basket, it just goes to show how important the optimization aspect of channel marketing really is - as opposed to simply expanding distribution. HOW you advertise your properties and HOW you manage your bookings on these channels is what really makes all the difference. These channels are growing more competitive all the time, with thousands of new properties being added to their inventories every single quarter. And we’ve actually been seeing most of our markets grow by 2X and 3X in the past 12 months alone. Successful channel marketing requires a strong understanding of how these algorithms work, and a deep knowledge of the process that travelers naturally take when researching vacation rentals online. If you can provide/convey enough value, use the right optimization techniques & pricing strategies, and use each channel to its own full potential, you can rise above the clutter and generate a solid and consistent stream of bookings. At the end of the day, if you’re already listed on just 2 of the website families on this list, you’re already targeting all the traffic you need to maximize your occupancy and rental income. But if you’re not hitting market leading occupancy, you probably need to focus on optimization, not more distribution. Charles is both the Head of Marketing and the Chief Vacation Rental Strategist at V R P ; a world-class marketing & booking management agency dedicated exclusively to luxury villa owners & managers. "The only vacation rental agreement sample you'll ever need - Free Download"